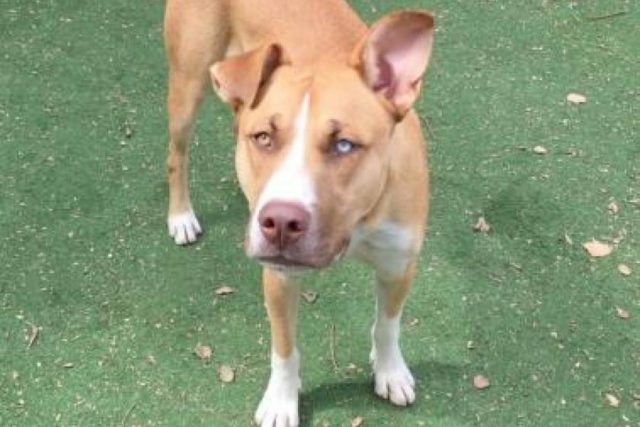 Binx is a gorgeous mixed breed pooch with one blue eye and one brown eye. He loves to run, play, hike, and enjoy the Arizona outdoors. In addition to his good looks and adventurous spirit, he is potty trained, sits and shakes on command, and loves kids and other dogs. Despite his perfect resume, Binx was recently returned to the Arizona Animal Welfare League after just 48 hours with his new family. The reason? He is just TOO GOOD! Binx’s adopters could not stop singing his praises on the surrender form, describing his gentle nature and obedient manner. His friends at the AAWL concluded the family must be looking for a more challenging pup. While many people have responded negatively to Binx’s story, his friends at the shelter want everyone to know that they support the adopters’ decision. They would much rather have one of their precious pets back in their care than living in a home that is less than ideal. “Everyone has different lives and choices, and now Binx can find that perfect home, and they can find the right dog for them,” AAWL told iHeartDogs. Sometimes a relationship simply isn’t a good fit. But don’t worry, Binx certainly won’t be down for long. His new-found fame is sure to make him the Arizona Animal Welfare League’s most eligible bachelor! If you are in the market for a perfect pooch, check out Binx’s adoption page!